Part two of a landmark breathwork and meditation course from a Tibetan Buddhist scholar. Volume Two contains 10 CDs for the advanced practitioner. 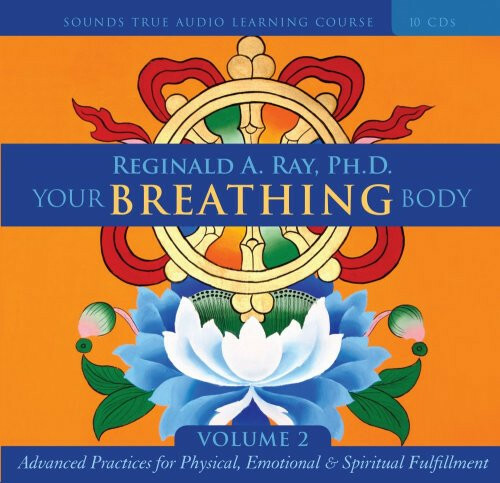 Blending somatic practices and breathing techniques from cultures and traditions around the world, Reggie gives you a practice-focused program that will show you how to “fathom your breath to its full depths” for physical healing, emotional balance, and, ultimately, the direct experience of who you are and where you fit in the cosmos. This is the real stuff! Reggie's program is totally amazing. What you learn to master in this program is to "download" pure Spirit into different spiritual “gateways” in your body (The Tan Dien, The Heart, The Throat etc) in a way that is guaranteed to resonate with your soul and change your life forever. If you are a serious meditation practitioner, don’t look any further. You don't need any other meditation techniques than the ones you will learn to master in this program. The program covers all the bases and more. It is a challenging program but if you are serious about meditation and willing to sit for at least one hour a day, and by doing so make it possible for you to find out what Spirit is all about for you personally (instead of watching TV, for example). It is guaranteed that this program will change your life forever! Not just make you feel better and less stressed out, as so many other meditations techniques does. I am using the series as a followup to Dharma Ocean's Sutrayana course, with the guidance of a meditation instructor assigned from Dharma Icean. The series is great--unlike what I experienced in the course, it is tailor made for self study, with a great intro of theory for each practice, clear instructions and a good guided session. What is missing is perhaps a user text file that overviews the whole package. Also it would be helpful if the files were labelled in a more descriptive fashion.